States are feeling emboldened in light of the 2010 elections. Increased amounts of Republicans, particularly Tea Party backed victors, believe they have a mandate to oppose the Obama administration. Part of this is a belief that the president and the Democratic 111th Congress were too activist in their policy making. The other part is an underlying trend of states pushing back against what they believe are federal encroachments of state autonomy. States are engaging in debate on a broad range of issues that can affect federalism, such as a “repeal” amendment, repeal of the 17th Amendment, and repeal or non-implementation of the Patient Protection and Affordable Care Act. Some states are addressing numerous federalism issues simultaneously. For example, Blogger Craig McDermott has started a catalogue of all the anti-Washington resolutions debated in Arizona. An industrious person in Virginia could probably do the same for that state. Virginia Delegates Mark Keam and Ken Plum tweeted and editorialized about the utility of such resolutions while they were being debated. Once passed these resolutions or constitutional amendments are forwarded to Washington. Known as memorials to Congress, the practice has predated the founding of the Republic. The memorials are not binding on a state’s delegation, but they do provide some sense of the attitudes of states toward federal policy action. The 112th Congress is not unique in attracting memorials from states on federalism issues. I recently collaborated on a research project with Justin Gollob of Mesa State College that analyzed the content of memorials to Congress from 1987-2006. Most of the memorials addressed an intergovernmental issue. However, we isolated memorials that addressed the general topic of state-federal relations in the American system. Memorials that appealed to the spirit of the 10th Amendment often called for a Federalism Summit that gained traction during the mid-1990s. During this period several states also attempted to change to Constitution to allow states to initiate Constitutional amendments, thereby bypassing Congress. The ostensible purpose of this change would be to create a new federalism amendment to protect states from what they believed were encroachments of their power. Interestingly, there were few calls for increased federal transfers to states. 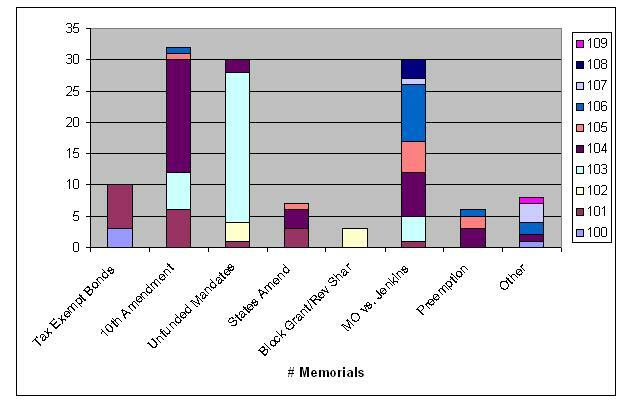 Consequently, block grants and a return to federal revenue sharing were not popular topics of Memorials. 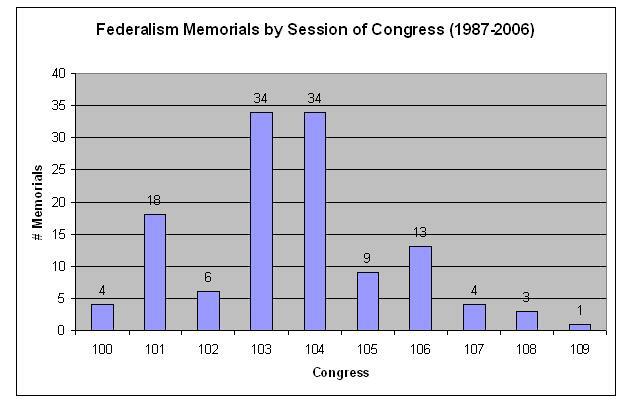 As the table below indicates, these federalism memorials appear to come in waves. The mid 1990s were a period where state criticism of the federal government reached a critical mass. State officials shared a bipartisan sense of displeasure with the federal government during the 1990s. It remains to be seen whether the current wave of anti-Washington resolutions also crosses party lines or only comes from states with insurgent Tea Party movements in their state legislatures. For more on the research please see our article in State and Local Government Review. For more on the methodology please see the Policy Agendas Project and the Pennsylvania Policy Database Project at Temple University. This entry was posted in American Federalism in Action, Views from the States and tagged 10th amendment, anti-Washington, Arizona legislature, federalism, intergovernmental relations, memorials to Congress, repeal amendment, Tea Party, Virginia legislature. Bookmark the permalink.